Training: Most pet behaviorists agree that training is essential for building the confidence of insecure dogs like Kayden, and it has certainly proved helpful for us. We spent several weeks in basic obedience and canine good citizen classes with Kayden, teaching him practical skills like “wait” and “leave it,” as well as fun games like “high five.” No matter the skill, helping Kayden learn what we expect of him helps boost his confidence. Classes also helped him feel more comfortable with new people and dogs in new environments. Perhaps most importantly, instilling commands like “come” were (literally) lifesavers, in case Kayden is suddenly scared and tries to flee. Passive socialization: The second key to helping Kayden become a more sociable guy came when I started bringing him into the office. I knew that expecting him to go desk to desk looking for treats and pats was unreasonable at first. So, I never asked him to “do” anything. He was free to hang out under my desk, but he would hear the voices of call center reps, watch the other dogs greet the UPS man, and occasionally be offered treats by co-workers. This passive exposure lead to him becoming more outgoing, and in the span of a few months he would sometimes explore, finding his way to other departments and seeking out snacks and the best toys. He’ll routinely return to a hidey hole under my desk if things get to be too much for him, but his willingness to make friends has increased tremendously. Additionally, take a look at where your dog spends most of his time at home. If he likes to hunker down in his crate, consider moving the crate into a more common place in the home. We noticed that after moving his crate out of the spare room and into the living room, where he’d hear the TV, the mailman, and our other dog, Kayden became more interactive. Adventures: What are normal errands for us are adventures for a shy dog. Whenever I get a chance, I take Kayden on excursions such as trips to the coffee shop, a ride through a drive-thru, the car wash, or a stop at a new park. Keep visits brief, try to avoid peak traffic times, always make sure your dog is safely on a leash or restraint, and give plenty of positive feedback when your dog does something social. Don’t praise or reassure when he retreats or backslides. It’s best to just ignore shy behavior and quietly let him know when he’s done something good. Exercise: Kayden has always been a sporty guy, into running, walks, swimming, and playing fetch. But it wasn’t long before we realized Frisbee was a special game for him. While he’s certainly not a champion disc dog in the making, the challenge of chasing down a big slobbery disc is so rewarding for him. Since he’s particularly shy with men, we encourage him to play a few games of Frisbee with the guys in the neighborhood. Sometimes I’ll wear a hood or carry an open umbrella (triggers for him) while playing Frisbee, to show him that good things happen even when these weird objects are in his presence. Whenever he’s had a good round of play, he’s confident, affectionate, and very attentive. 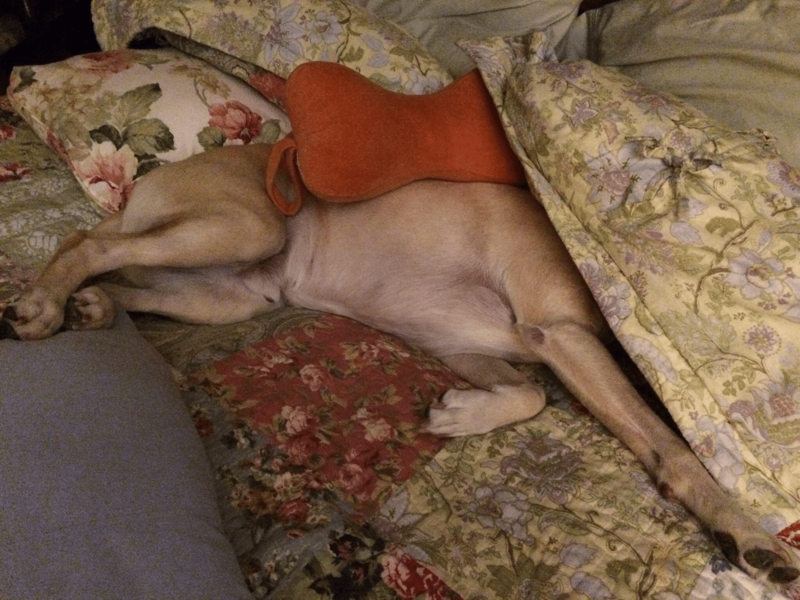 Overnights: Just as when a kid overcomes homesickness on his first sleepover, a dog can overcome social anxiety through sleepovers in dog-friendly environments. Kayden occasionally spends time with co-workers, pet-sitters, or at a dog spa. Just as he built confidence in foster homes before finding us, continuous exposure to new people, pets, and places pays into his confidence bank.